The Mission Hospital, Durgapur (A Unit Of Durgapur Medical Centre Pvt. 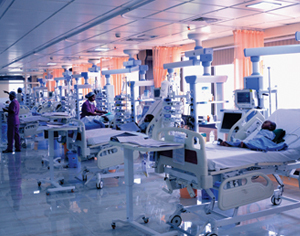 Ltd.) is a 360 bedded, state-of-the-art super specialty hospital, with cutting edge technology. Built in an area spanning three acres it offers an array of facilities- digital flat panel cath lab (Philips FD 10c), seven major operation theatres with laminar airflow and HEPA filters, 100 bedded critical care unit, dedicated mother and child care unit, 24 hour accident and emergency department, blood bank and for the first time, a fully computerized pneumatic chute system (Sumetzberger, Germany). This is a hospital with "futuristic" technology and enriched with "brilliant minds" behind the equipments. The Mission Hospital started its operation on April 02; 2008.This is the first super specialty corporate hospital in Eastern India outside Kolkata. 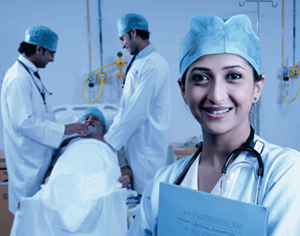 The hospital has taken an initiative to amalgamate and integrate the best in healthcare be it manpower or technology. It has been set up with the vision of providing quality healthcare at affordable cost and within the reach of every individual. The hospital has been able to establish its presence in Eastern India and its neighboring areas through its patient centric and high quality care. The Mission Hospital is committed to providing affordable, quality health care to patients by incorporating improvement in its day-to-day schedule. The NABH accredited, Mission Hospital, Durgapur is now also an Associate Member of the International Hospital Federation (IHF) for the current year 2017. The International Hospital Federation (IHF) is a non-governmental international organization, located in Bernex (Canton of Geneva), Switzerland. It is a global association for healthcare management, whose primary mission is to improve the health of societies through cooperation between participants within the worldwide health sector. The Mission Hospital, as an Associate Member, recognizes itself as one of the few well managed hospitals and health services where all individuals seeking treatment and cure can reach their highest potential for health.